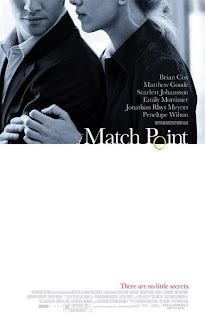 Not a huge Woody Allen fan, but I've been hearing good things about Match Point. With the Oscars this weekend, I guess other folks had the same idea to take in a film. The usually empty Landmark had a longish line and nary a parking spot in sight. Once the lights went dim, I was sucked into the seductive tale of a former tennis champ who charms his way into a weathy British family and finds himself trapped in a web of his own making. Much darker than I expected. Chilling, perfect to go along with the somber London cityscape.